The Resuscitation Council (UK) states that less than 10% of people who have cardiopulmonary resuscitation (CPR) outside hospital survive. By discussing CPR with older people in care homes, are we offering them false hope? The phrase ‘between a rock and a hard place’ describes being faced with two equally difficult alternatives. As nurses, we ask older people to choose between a rock and a hard place when we either attempt the life-saving procedure of cardiopulmonary resuscitation (CPR) or provide comfort measures only. When asked: ‘Do you want us to perform CPR if you stop breathing?’ most people will say yes. We think we know what CPR involves: it is often portrayed on television dramas with the actor quickly feeling better, sitting up in bed and having something to eat and drink. However, CPR has a poor success rate. The Resuscitation Council (UK) states that less than 10% of all the people who undergo resuscitation attempts outside hospital survive. In nursing home populations with multiple long-term conditions and frailty, CPR often ends in a violent death. 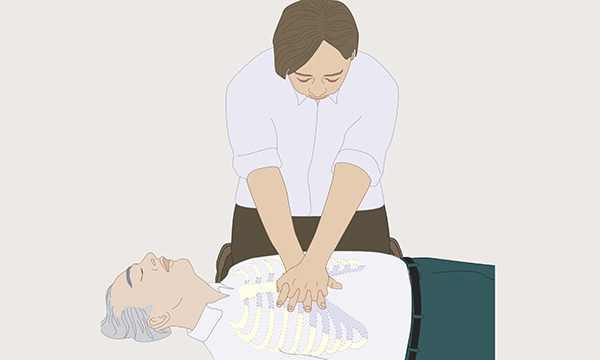 It is not a good experience telling older people and their families what CPR actually involves: chest compressions that may cause fractured ribs, bruising and internal bleeding. When I explain the procedure most residents agree that they would prefer to die a natural death. However, some think CPR is a chance to avoid death. CPR should not be offered to people in nursing homes when it is likely to be unsuccessful in preventing their death. Comorbid conditions are associated with cardiac failure. The inevitable outcome is death, yet we seem to have trouble accepting this fact. Residents should be made aware that as they approach death we will care for them confidently, ensure that they are comfortable and surround them with the people they love. If they want to talk to staff about death, we will listen actively and respond. I have convinced all the staff I work with to have these conversations. Some are better at it than others, but they all know that it is the right thing to do. As a result, we can be sure that our residents die in comfort. CPR burdens older people with the emotional trauma of suggesting there is a chance to extend their life. When people have reached the end of life we should enable them to die in peace.